Laura D. Johnson, MSS, is passionate about healthcare and healing. She uses current, safe and effective procedures to treat scars, wrinkles, large pores and thinning hair. She understands looking into the mirror and not liking how age has changed your appearance, and is enthusiastic about helping women look how they want, while still keeping a natural look. Johnson has expertise in aesthetic cosmetics, family practice, emergency medicine with a special interest plasma therapy and hair restoration. She has received training in the field of cosmetics, enabling her to perform facial and aesthetic procedure to the highest standard, and is happy to offer Botox, and dermal filler such as Juvederm, Radiesse, Restylane and many more. Johnson received her Bachelor's of Science Degree in Nursing from Dillard University in New Orleans, LA. 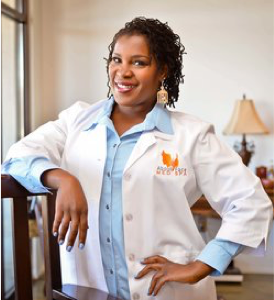 She continued her education at Saint Louis University in St. Louis, MO and graduated as a Family Nurse Practitioner with a Master's of Science Degree in Nursing.